Modern business representatives have already appreciated the importance of having a site. It is not only a good marketing approach but also a perfect place for retail. Many of them continue to look for the best systems for their future websites and Drupal sites appear at the top of the rating. Why are Drupal-based websites referred to the best ones? There are two aspects that can be considered to answer this question: the influence of the CMS and the advantages of a created website. Every Drupal project is rather easy to develop and simple to use. Websites using Drupal are perfectly managed, developed, customized and upgraded. Almost each second site on the Web is a Drupal sample. Sites made with Drupal are large-sized, complex, exclusive, bright, extensive and highly scalable. There is a variety of Drupal examples for developers on the Internet including lists of powered by this CMS sites and a variety of both responsive and non-responsive themes. There is an extensive API support for Drupal sites. Websites that use Drupal 7 or 8 are SEO-friendly and mobile-ready. 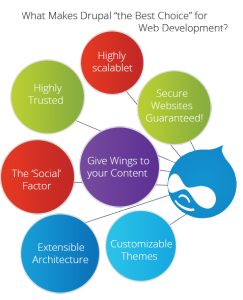 According to the case studies Drupal is the most powerful for today content management system used for creation sites. Each new case study highlights incomparable websites and apps created using this CMS. They focus on the perfection of the performance, design, customization, interaction and appeal to the visitors, so there are no reasons to doubt if it worth ordering a Drupal website. Web Peppers is a professional web-development company that majors in Drupal solutions. We have already created hundreds of successful websites that please both their owners and people, who visit them. All this is due to a great and skillful team of developers, who do their best to create exclusive and top-notch websites. Looking through the portfolio of each our developer you will be impressed how many famous companies used to order the services of our company and are pleased by the delivered projects. Each client who orders a Drupal website in our company knows that he will receive a premium product for reasonable money, within the shortest period of time and in accordance with his strictest requirements.